Jan de Vos: In the flesh. Update: July 25, 2011, Jan de Vos died yesterday morning in Mexico City. Below is my sketch from last month in Chiapas, Mexico. We met a holy man in Chiapas. Jan de Vos is 75 years old. He was born and educated in Belgium, He studied philosophy and theology with Prof. Ratzinger, who is now Pope Benedict XVI. He earned his Phd in humanities and was ordained as a Jesuit priest in the Roman Catholic Church. In 1973 he was sent to Chiapas, Mexico, as a missionary. His task was to teach the indigenous Maya about God. It dawned on him that the Maya had things to teach him about God and life. 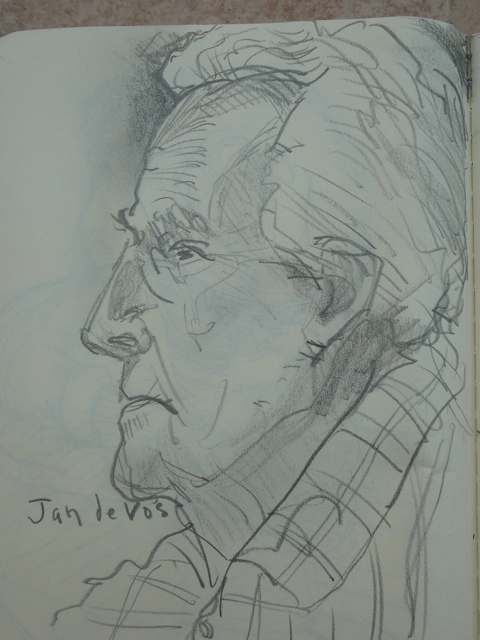 I drew the pencil sketch portrait above as he began his informal lecture in a hotel room in Palenque, Chiapas. He began by declaring we were in a sacred place. Not only sacred because of Lord Pakal’s tomb in the Temple of the Inscriptions, but also because of the work of a humble missionary, a Spanish friar named Pedro. Friar Pedro de Lorenzo de Nada came to Mexico in the mid-1500’s. “De Nada” means “of nothing”, something he added to the name the church gave him. Jan de Vos considers Friar Pedro more significant than Bartolome de La Casas, Bishop of Chiapas. 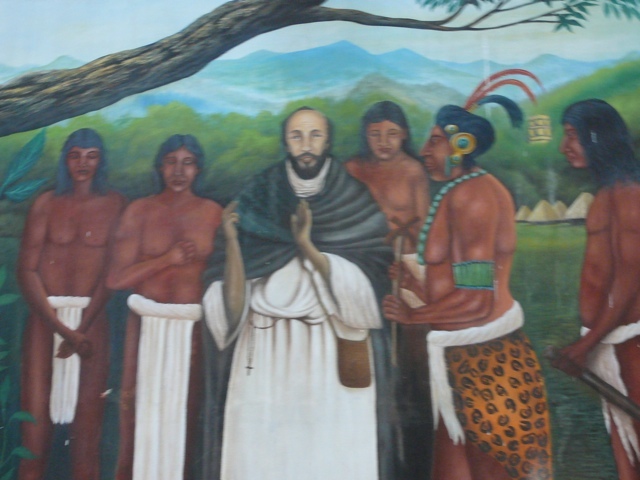 Like Jan de Vos, Friar Pedro was a linguist; he learned four Maya languages. Friar Pedro tried to live the gospel among the Indians, but to do so he had to “cut his relations with his superiors.” He climbed over the wall to escape the monastery and lived the rest of his life among the Maya of Chiapas. De Vos lamented that few visitors to Palengue are interested in Friar Pedro’s story. De Vos wrote his first of many books of Chiapas history about the runaway priest. Father de Vos could relate to the difficulty of “de Nada” and the early missionaries. He imagines them teaching the Our Father. “Our Father?” They must mean Our Mother, think the Indians. “Who art in Heaven?” But, She is in the Earth, say the Indians. The Indians hid Friar Pedro from the authorities, both the church and civil authorities in Guatemala wanted to catch and discipline him. In that time, Chiapas was ruled from Antigua, Guatemala. Today, Chiapas is governed (to the degree that it can be governed) by Mexico. In 1571, Friar Pedro gave three bells to Indians. Jan de Vos told us one of the bells was still in the Palenque village church. The next day I walked to the yellow church at the center of the small town. I found the painting of Friar Pedro on the wall in the left chapel. Below, painted on the wall, was a caption written by “Jan de Vos, historian.” I saw no bell. There was one Indian man, his straw hat at his feet, lighting candles and intently praying in a Maya language. I did not disturb him. On the right side, in a chapel near the confessionals, I found a caretaker sweeping. His name is Manuel, I asked him about the bell. I wasn’t sure he understood my Spanish. After a moment, he asked who told me there was a bell. When I answered Jan de Vos, Manuel led me to a long storage room filled with brooms and half-used candles. We were directly behind the sacresty and altar. He moved some furniture and lifted the bronze bell. It was much larger than I had expected, nearly three feet tall. I asked if I could spend a minute there, drawing the bell. Manuel asked why. I told him it was a sacred object and that I had heard the story of Friar Pedro. Manuel told me that made his heart feel good. Manuel went back to work. I sat on a wooden box. It was 95 degrees outside and humid beyond metaphors. It was much hotter in the church. 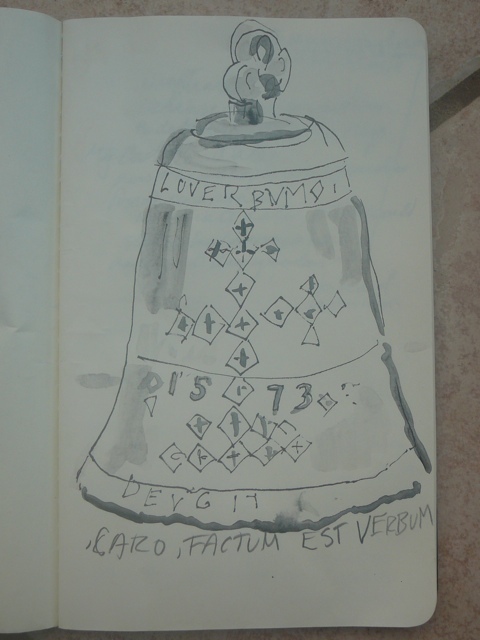 As I sketched the bell, sweat fell from my brow onto the bell and my sketchbook. In our digital age, one might ask what is the point of keeping a sketchbook? I have two thoughts on that. Drawing forces observation. Surely great photographers are great observers. Personally, I find drawing connects me with people and places in a better way. Secondly, I am in Mexico, a land of living arts, where work done by hand is deeply respected. Back to Jan de Vos. All during his talk about Chiapas history he had a single red file folder in front of him. At one point he opened the folder to reveal its contents: nada. De Vos, like Friar de Nada, went “over the wall.” In 1995 he was invited into the Lacondon jungle by the Zapatistas. That is another story.